Today’s events in Paris have prompted me to write this post. As the Irish writer, John de Courcy Ireland famously said: “every cultured person has two countries; France and their own”. This rings so true to me, especially as my early childhood and youth are closely linked to France. At the tender age of five, I started my education at the French lycée in Stockholm, run by French nuns. Thirteen years later, I graduated, having passed the baccalaureate with good results. Those years with the nuns taught me to speak flawless French with an accent that is as close to a native one as a foreigner can get. 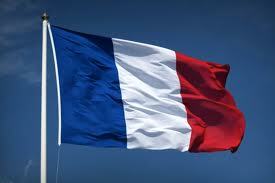 But it also taught me French history and literature and a love of everything French. I spent many a happy summer as the guest of a French family, who took me to their bosom and treated me as a daughter. I have heard that French people are generally considered to be unfriendly. I don’t have that experience at all. Quite the opposite, in fact. My first love affair was with a Frenchman (although I later married and Irishman). In France, I had my first taste of champagne, the first introduction to gourmet food, cheese and wine. Not to mention fashion and style. Later on, my husband was posted to the Irish embassy in Paris, where we spent the happiest years of our married life. My youngest child was born there during that time and I will never forget the experience. Ever since, we have managed at least one holiday a year in France and every time we go there, I have a feeling of coming home. Many of my books are set in France. But I will not post links to them here, as this is not about me. It’s with great sadness that I read about what’s happening in Paris and my thoughts and prayers are with the families of the victims. France gave me so much. I have just published my brand new Riviera novel, Selling Dreams to all e-book stores worldwide. I started writing it on a dreary, rainy day, when I needed a romantic escape to a warm, sunny place, where I’d mingle with handsome men and beautiful women while looking at stunning views. I needed to feel the sun on my skin and look out at the sapphire blue Mediterranean and sip chilled rosé wine on a terrace somewhere far away from the wind and rain. So, as I wrote, I did just that; I was there, in Antibes, in the south of France, sharing the romance and heartache , food and wine with Chantal and Flora, Daisy and Ross and all the other characters in the story. They became my friends and I worked hard to solve all their problems, while, in my imagination, I basked in the sun and swam in the warm, blue water. Now that’s it’s finished, I hope I can take readers on the same journey and provide an escape from winter weather, bad news, bills and household chores. In order to do this, I am offering this novel to readers at the rock-bottom price of $0.99 for the next couple of days. This way, you can escape to a beautiful place without leaving your house or forking out a lot of money, or even having to go to the airport. So, pack your imaginary suitcase with a swimsuit, sunglasses and a beach towel and come fly with me to The French Riviera. You won’t even need sunblock. Flora McKenna arrives in town with high hopes of finding happiness. When she immediately lands a great job, she decides that this exotic paradise might be just the place to help her heart heal. Selling houses to expats looking for a dream home in the sun would be the ideal existence if it weren’t for her demanding boss, Chantal—a woman with no scruples when it comes to bending the rules. But Chantal’s personal life catches up with her, and she is forced to ask Flora to run the agency. While trying to cope with French property laws and red tape, Flora is thrown into a love affair that threatens to break her heart. Set against the glamorous backdrop of the French Riviera with its stunning scenery, Selling Dreams is the story of two very different women travelling on paths filled with unexpected twists as they search for love and happiness . Come on in, the water is lovely. by Susanne O'Leary in Uncategorized Tags: Books, Brendan Behan, Ireland, Irish literature, reading, writing. 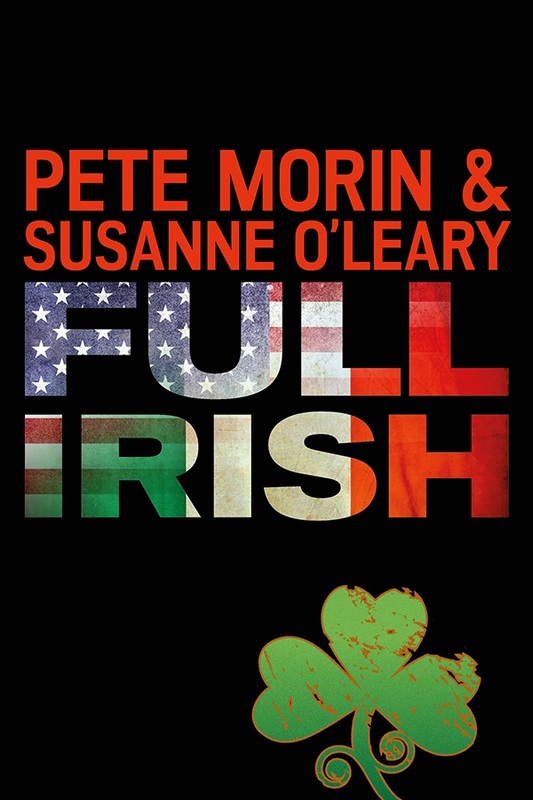 The publication of Full Irish my co-written Irish-American detective story has raised a few questions in my my mind, the main one being: how Irish am I really? Of course, my name suggests an Irish colleen with roots in County Cork, but that’s borrowed plumage from my marriage to an Irishman from said county. In fact, my Co-writer, Pete Morin is more Irish than I am, as his mother’s family name is Donnelly, originally from County Sligo. I have to confess to having been born in Sweden and there is no shame in that. Except when you market a book set partly in Ireland. But, although my first twenty years were spent in the country of my birth, the rest of my adult life were, apart from some years in foreign countries, spent in Ireland. I feel more at home here than in Sweden and, indeed, I am told I speak English with an Irish accent. Not only that, my connection with this country goes back to my early childhood, when my father came here on holiday as a young man and fell in love with this beautiful country and its people. It’s partly his ‘fault’ that I met and married my Irish husband of many years. My dad used to invite Irish friends to stay in our summer house in the islands and I have been familiar with Irish voices from the tender age of five or so. As my late father travelled around Ireland and mainly County Kerry, he befriended many an Irishman in the many pubs he visited (purely for local colour). One of these gentlemen was Brendan Behan. They met in a pub in Dunquin on the Dingle peninsula and started to talk, swap stories and (probably) risqué jokes as well. I do believe there was also some singing. (Brendan was a wonderful singer). As they parted, my father gave Brendan his card (as yo do) and said something along the lines of: “if you’re ever in Stockholm, give me a call”, not thinking for a moment this would actually happen. But it did. A few weeks after his return home, there was a phone call from the local police station in Stockholm to the house in the islands. Did my father know an Irishman named Brendan Behan? And if so, could he come and pick him up? Now, I know that at this time. Brendan was not drinking, so he was probably just being Irish and argumentative. He was also in the company of his wife Beatrice, a pretty, soft-spoken woman. They were both immediately invited to stay with us. This was in 1958 and, although I was just a little girl at the time, I have vivid memories of those weeks when Brendan Behan came to stay. I suppose it was because he was such a big, warm, noisy man with a great sense of humour and a loud, contagious laugh. I remember how he got up at 4 am every morning to work on the final proofs his book, The Borstal Boy, the first edition of which is still sitting in the bookcase in the summer house. He got the cover image during his stay, and proudly showed it to us. When he had finished the morning’s work, he cooked us all a Full Irish breakfast and that was my first introduction to this typically Irish feast. I have enjoyed many of those since then, but the ones cooked by Brendan Behan were the best. There are many tales of Brendan Behan, and most of them are of him being drunk and disorderly. That is not my image of Brendan. I simply remember him as a larger-than-life man, who was so kind to us children. A man who stood on the pier on a dark, moonlit night in August and sang an Irish ballad, his beautiful voice ringing across the black waters of the bay. A man who went to a Jussi Björling charity concert in the church on the island (Jussi had a summer house close to ours) and listened, tears rolling down his cheeks. I also remember him singing the ‘Ridi Pagliaccio‘ aria on his knees in front of my grandmother, making her both laugh and cry. Despite the fact that I, like my younger siblings, didn’t speak much English, Brendan managed to communicate with us using a smattering of Swedish he had picked up, and the few English words and phrases we knew. My dad later told us the story of their subsequent visit to a fancy restaurant in Stockholm. The Maitre d’ took one look at Brendan and hesitated about whether he should be let in to such a select establishment, saying “that man likes to drink”. When my dad translated this to Brendan, he replied: “tell him that’s the understatement of the century”. Brendan and my dad are both gone. I like to imagine them together in Heaven, sitting on a cloud, having a pint and singing Irish songs. You can now pre-order the ebook from Amazon, for the “friends” not-for-sale price of a mere 99 cents. When you pre-order, you don’t get dinged for the buck until the book is delivered automatically to your kindle on December 1, 2014. And more importantly, when you pre-order, you help drive the book’s ranking up, so by the time it goes live, it’ll already be in neon lights. But there is another kind of Full Irish that won’t impact on your waistline – a sizzling political thriller, set in Boston and Ireland, that will have you at the edge of your seat until you have turned the very last page. It might even make you laugh as you read the tongue-in-cheek prose and the mad dialogue. As a former fitness teacher and health freak, I urge you to turn away from the sausages and bacon, and resist the smell of that sinful plate of temptation. Have a cup of tea and a slice of Irish soda bread instead, and open your Kindle to enjoy this fun read. If you pre-order now, you’ll get it at the rock-bottom price of 99 cents! by Susanne O'Leary in Uncategorized Tags: Boston., crime fiction, detective story, ebooks, fiction, Irish, Pete Morin, political thriller, reading, suspense, writing. I was going to be lazy- as it’s Saturday night- and just reblog Pete’s’ post But then I thought I should really give my own take on our collaboration of this quirky, fun political suspense, full of twists and turns and dark humour. I owe it to Pete, as he put such hard work and effort into it. We both did. I’m very driven as a writer but, to my surprise, so is he, which I didn’t expect at the start. The fact that we’re both impatient and a little pedantic caused a tiny bit of friction at the beginning of our collaboration, as the frustration of trying to match our styles and ideas grew. It was little bit like the push-me-pull-you animal in Doctor Dolittle, pulling in different directions. But with time, we adapted and found a good way to write together. I think, as the project took shape, we parked our egos at the door, so to speak, and started to care about the story and how to make it the best we could. Any collaboration has its teething problems, of course, but it didn’t take us long to find a smooth path and then we were rolling and enjoying the journey. I have known Pete a number of years, ever since the good-ol’ Authonomy days and we have been great Internet friends since then. I have enjoyed his honesty and wry humour on many occasions. But one especially comes to mind. I few years ago, I was invited to take part in a chat show on national radio here in Ireland. Eamon Delaney and I were going to talk about our different experiences of life in the Irish diplomatic service. This was toward the end of the Celtic Tiger era and RTE still had money to spend on tiny ‘celebs’ such as me. I was put up at a swanky hotel in Dublin at their expense the night before the show. Finding myself all alone in this hotel room, I thought I’d message a friend to show off. Nobody was available, expect Pete who, to my e-mail of ‘woohoo, guess where I am, etc’ just replied: ‘stay away from the minibar’. Which made me laugh and also put me firmly in my place. We started exchanging ideas at the beginning of May, outlining plot and characters, and got stuck into the real work about a week later. Since then, we have worked at a steady pace all through the summer months and into autumn, and here we are-with a finished, polished, edited novel ready to go in just under six months. We loved writing it. We hope readers will love it even more. 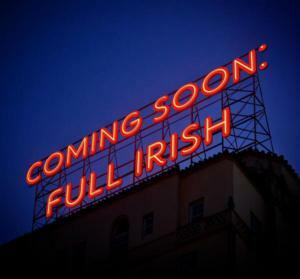 FULL IRISH will be published at the end of November. As the cover of her books suggest, Lynda Wilcox’s cozy mysteries are, apart from being well written and truly enjoyable, laugh-out-loud hilarious. I’m reading one of them myself at the moment and it’s a real treat. As I wanted to know more about Lynda and her books, I decided to grill, I mean interview her in order to share this lovely and oh-so-British author with mystery aficionados who might have missed this author’s work (you can thank me when you’ve read her books). 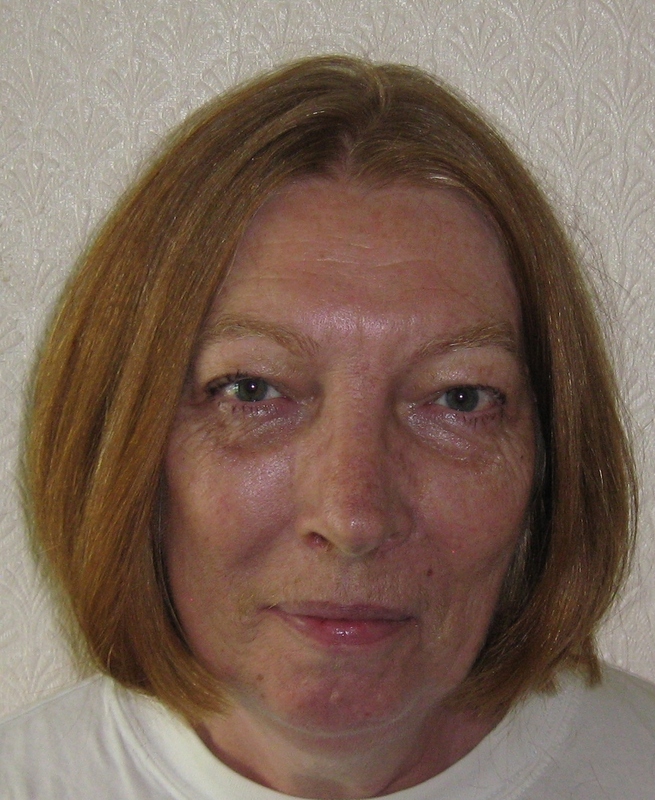 Lynda Wilcox’s first piece of published writing was a poem in the school magazine. In her twenties she wrote Pantomime scripts for Amateur Dramatic groups and was a founder member of The Facts of Life, a foursome who wrote and performed comedy sketches for radio. Now she concocts fantasy stories for older children (10-13) and writes funny whodunits for adults. Lynda lives in a small town in England, in an untidy house with four ageing computers and her (equally ageing but very supportive) husband. She enjoys pottering in the garden where she grow brambles, bindweed and nettles along with roses and lilies. Oh! And slugs! Slugs that feed well on everything but the brambles and weeds. Most of all, she loves to write — it gets her out of doing the housework. She also reads a lot and enjoys good food and wine. The current work in progress is the second in my Gemini Detectives series – stories about twins Linzi and Loren Repton who, fed up with boring office work, decide to open a detective agency. Linzi is logical and analytical, while Loren is impetuous and intuitive – although sometimes her ideas are so “off the wall” they have a habit of rebounding and hitting the twins on the back of the head. Alternately frowned on and watched over by their father, who is himself a Detective Superintendent in the local police, they are assisted in their crime-solving efforts by Magda – a mysterious old bag-lady. Is your work different from others in your genre, if so, how? Well, I can guarantee you won’t find any cupcakes in my stories! These days it seems cozy mysteries have to have a “hook”. Whether it’s crime-solving cats and dogs, or cooks/embroiderers/and plant shop owners with a penchant for detection there is a plethora of idiosyncratic sleuths out there. Because of that, I try not to be too quirky or too gimmicky. Both the Gemini Detectives and The Verity Long Mysteries are simply old-fashioned whodunits, though the latter has a lot of British humour. The first book that I read as an adult – of course I was an adult, I was 15 and, like all teenagers, considered myself very grown-up – was by Agatha Christie. I think it was Murder on the Links, and I was instantly hooked. I’ve since read every single one of her seventy-five crime novels – some of them several times over. I lapped up Poirot, Miss Marple, and Tommy and Tuppence and, in the meantime, discovered other writers from the Golden Age of British crime fiction – Margery Allingham, Josephine Tey, and Patricia Wentworth amongst them. It is hardly surprising, then, that when I came to write, I tried my hand at what I loved best, even though I can only dream of emulating the likes of Agatha Christie. She, for me, remains the doyenne of the genre. Her well thought out plots and clever writing sprinkled with humour, delight me to this day. If my readers get half as much fun and enjoyment out of my books as I did from hers, then I shan’t have gone far wrong. I am a slow writer, both physically and mentally. Once I have a plot mapped out – which alone can take many weeks, if not months – and start writing, I often discover the characters and the plot take on a life of their own. I write myself into corners and dead ends and often despair of ever finishing what, to start with, had seemed like a great idea and one I was excited to write about. Add to that my inability to type (accurately, at least) and I’m having a good day if I manage to write a paltry seven hundred words. Sigh. Do you ever suffer from writer’s block and if so, how do you deal with it? Yes, all the time. See above about procrastination! They often come to me, to be honest. They have a nasty habit of creeping into my brain just as I’m falling to sleep. For the rest, I trawl my memory for people I’ve met over my (fairly long) life, though I usually merge them – one person’s looks added to another’s personality – so they can’t be identified. Some, however, (like Verity Long’s crime-writer boss KD) are totally made up – in this instance by what I imagine a full time best-selling author would look like and wear, and then giving her a grand house and publicity hating character. Do you ever want to try another genre? I’ve been dabbling recently with a new idea, so yes. It’s a series of supernatural stories set in and around the sacred sites of England – like Stonehenge, for example. Being me, of course, I can’t help putting a mystery at the heart of them, although I think they’ll concentrate more on romance than I usually do. Whether I’ll ever get round to writing it remains to be seen. Don’t hold your breath! by Susanne O'Leary in Uncategorized Tags: Books, reading, writing. As I work hard to finish Selling Dreams, my fourteenth novel, which will be published in December, my thoughts go to my readers, especially those who have been so supportive and encouraging. It’s mainly because of them that I have upped my writing speed and work harder than ever to produce a book every five to six months. It’s their enthusiasm in many e-mails and Facebook messages that spurred me to produce yet another title, this time with a different setting. It’s not because of them that I write. But they are the reason I try harder. I write because I love writing, the thought process and the magic of creating new characters, setting the story in places I have been and loved. This new one, which I plan to follow up with two more books, turning it into a new series, is set in the south of France, where I have spent so many holidays and shorter breaks. It’s magic at any time of the year and I want to take my readers there on an imaginary journey. As I write, I’m there myself and the story is beginning to shape up in surprising ways. Strange that you start off with one story in your head, but always end up with quite a different one as the characters take on their own lives and do things you hadn’t planned at all. That’s the magic of writing. When you’ve finished the book and get out of the writing trance, you begin to look at the next step: publishing and marketing. Of course I write mainly for the love of it but what is a story without readers? Hard working writers do actually want some kind of rewards for their hard work. And hard work it is. I spend an average of four hours a day just writing. Marketing and publicity take another hour or so on top of that. Revising, rewriting, editing, formatting, cover design comes next once you’ve finished a book. AND… the (insert bad word) blurb! That’s nearly harder than writing the whole book. You try to put the gist of a 300+ page book into a few sentences that will sell it to new readers. An impossible task that makes you want to scream. Then you’re off again on a new book, which has to be ready five months later because readers want the next one very soon. If you want your favourite author to keep writing, you have to help them sell their books. How can you help them? By spreading the word. By creating that powerful ‘word of mouth’ that authors need for books to sell. It is that magic ‘thing’ that keeps books selling and keep writers writing. No writer writes ONLY for themselves, even if the love of writing helps create great books. I hope I never lose that love, but writing will turn into a very lonely occupation with no readers. How can you, the reader keep me writing? By telling your friends, neighbours, cousins, aunts and uncles about my books. By chatting about them on Facebook, your local café, in the supermarket, the hairdresser’s, the dentists, well perhaps not there, but you get my drift. Without your help, the writer might not feel motivated to try so hard anymore. And if that happens, you’ll have fewer and fewer books to read. I’m a reader too. I try to shout about my favourite authors, because I want them to keep writing.